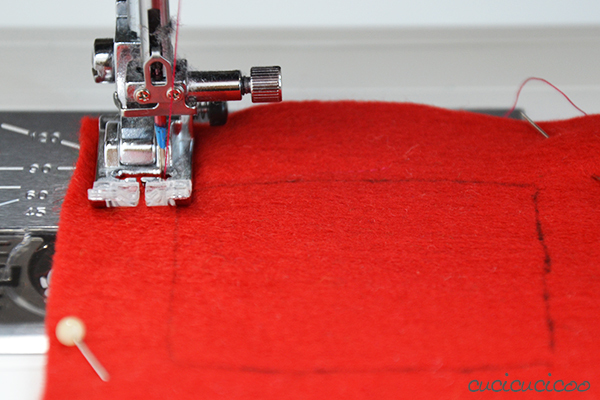 A few days ago I showed you how to sew while considering seam allowances. I’d say that most things are actually sewn inside out and then turned right side out in different ways. We still haven’t gotten to those techniques, though, and I want to make sure that the practice tutorials for the Learn to Machine Sew course use only the skills covered up til that point. So I decided to use a type of fabric that I don’t use very often and that can be worked in different ways that regular fabric: felt. And why not felt coasters? 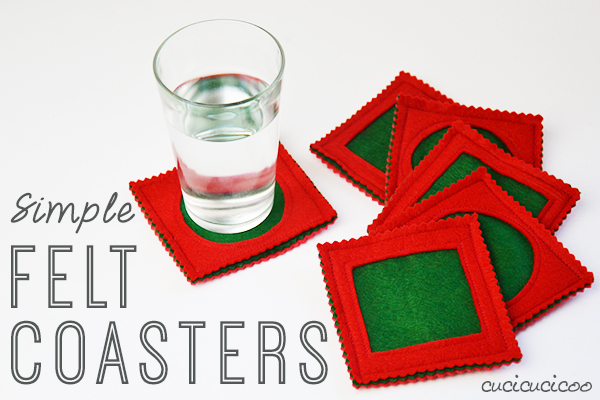 We can all always use some more coasters in our homes and they also make a great gift, plus they’re really simple to whip up. 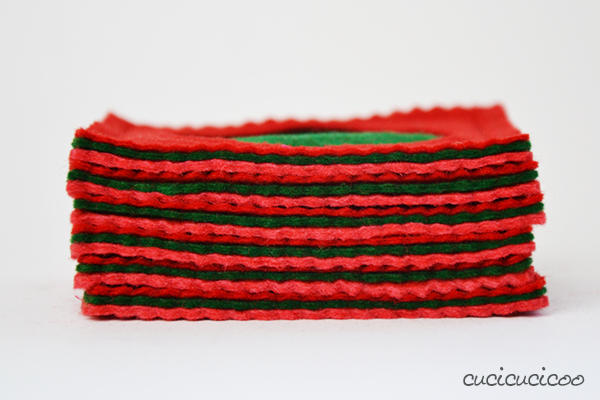 But just plain felt coasters would be a little too simple, but a bit of very easy reverse appliquè gives them that little bit of pizzazz that they need! But let’s go one thing at a time. First let’s talk about felt. 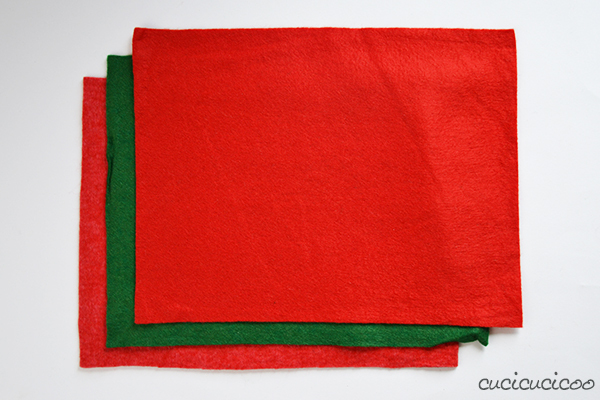 The easiest felt to find (and the cheapest) is synthetic craft felt, which is what I used for this tutorial because my mother gave me a bunch of her decades-old felt a couple of years ago and I had yet to use it for anything. I don’t particularly adore acrylic felt because of how it feels and also because I prefer natural fibers, but a great alternative is to use felted wool. I’ve heard that you can buy sheets of wool felt, however I’ve never actually seen it in person. One thing I love to do is to felt up woolen sweaters in the wash and cut those up, although they can get pretty thick that way. A great resource for projects made with felted wool from upcycled sweaters is Betz White’s Sewing Green *, which actually has some very adorable hand-sewn felted wool coasters, come to think of it. A great characteristic of felt is that it does not fray, meaning you can just cut the edges and the fabric won’t fall apart. This is why I chose it for this project. 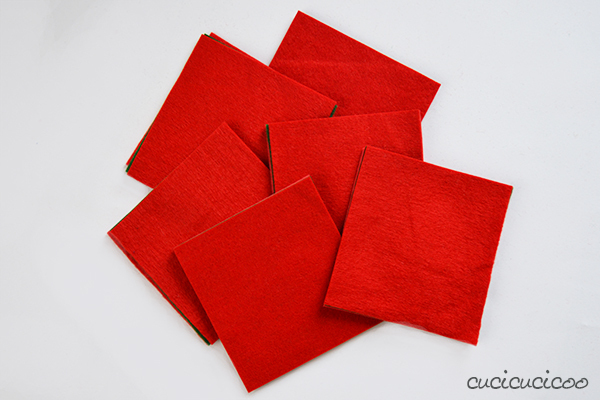 Grab three 9″ x 12″ sheets of felt *, two in one color and the third in a contrasting color. Like I said before, my felt was decades-old, so not necessarily in perfect condition. Also one sheet of red was sort of a funny shade, so I designated that one for the bottom layer. Stack the three sheets of felt one on top of the other, with the contrasting color in the middle. Then cut them into equal-sized squares. Mine were 4 1/2″ x 4 1/2″. I got perfectly straight cuts by using my rotary cutter * but you can just use regular scissors, too, because we will be trimming the edges later on. You might remember one of my recent refashion projects, layering two shirts and embellishing them with reverse appliqué in a leaf design. Reverse applique is basically just cutting out a shape from a top layer of fabric, exposing the fabric in a contrasting color beneath. It can be as simple or complex as you want to make it. 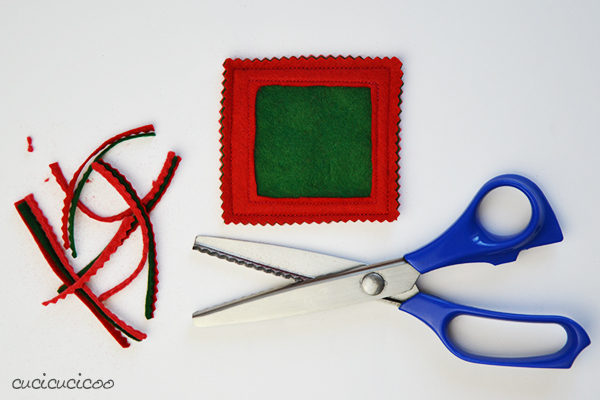 Seeing as I had red and green felt, I’d originally thought of making a Christmas tree reverse applique design, but then decided to keep it simple for the purposes of this tutorial and decided on just squares and circles. Make a template of whatever shape you want to cut out of the coaster. To make mine, I folded some scrap paper in half three times and cut straight up from the folded edge for the square and up in a curve for the circle. 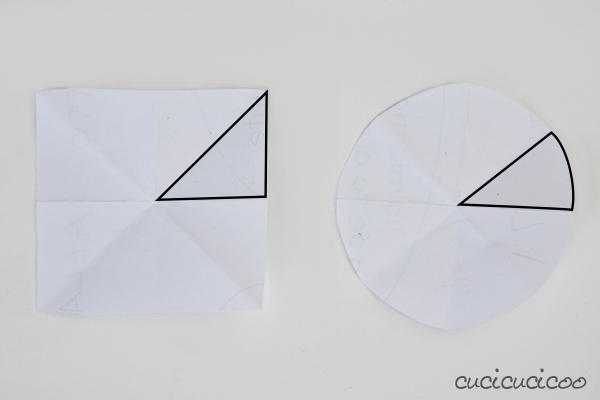 Imagine that the outlined segments above are how the paper is folded and then cut. Trim as necessary. 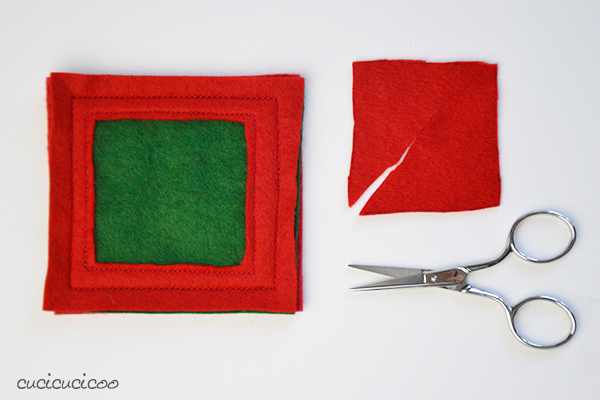 Place the template in the center of a felt square and make sure that there is at least 3/4″ around it on all sides. When it’s the right size, trace around it with a regular pen. Pin the three layers of felt together. 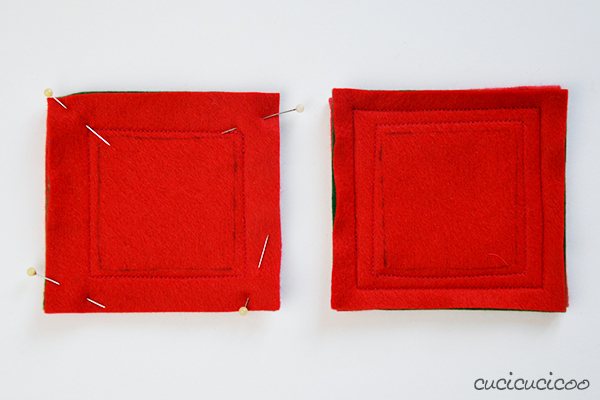 Now you need to sew a little bit outside of the traced shape. Do you remember my trick for sewing with a 4 mm seam allowance that I showed you in the seam allowance lesson? Move the needle to the right and line up the pen mark with the right side of the presser foot. I actually decided to use an even smaller seam allowance by lining up the pen marks with the inner metal edge of my presser foot, but do whatever you prefer. I do suggest using a slightly longer than usual stitch length for this project because of the bulk of the felt. 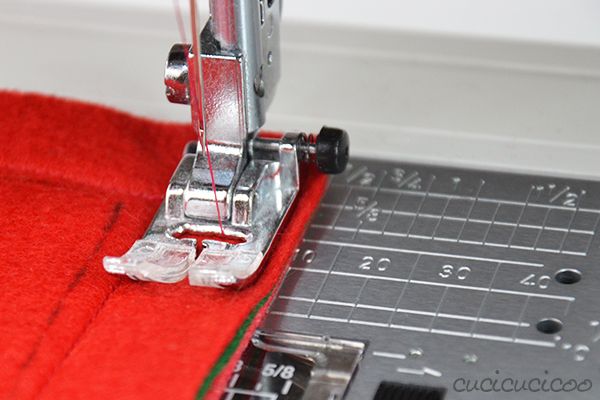 Then sew around the outside fabric edges with a 1 cm (10 mm or 3/8″) seam allowance. Here you can see what the coasters look like after sewing around the inner shape and after sewing around the outside edges. 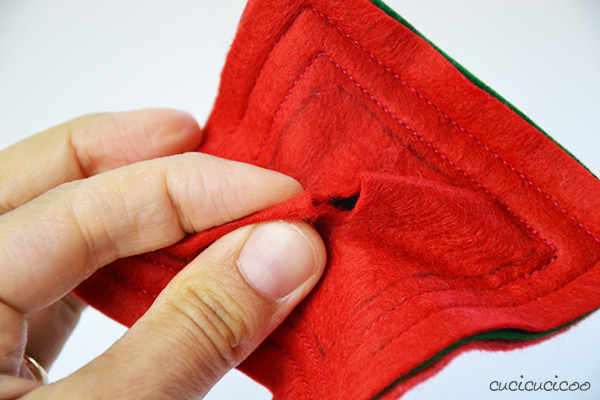 Pinch just the top layer of felt with your fingers. When you’re 150% sure that you only have the top layer, make a little snip in the fabric with your fabric scissors. Slip your scissors into the hole you’ve made, cut towards the outlined shape and cut it out just outside the pen marks so that they are completely removed. Embroidery scissors * are great for this task. And finally trim the edges with sharp pinking shears * to make nice zig-zag edges. I love the look of pinked edges on a nice thick fabric! 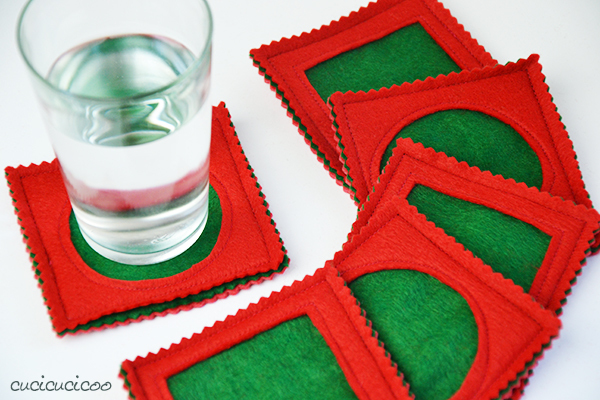 And there you have your cute little reverse appliqué coasters! You can go wild with different colors and coaster or appliqué shapes, personalizing them no end! Tie them up in a little bundle and make someone happy with a useful handmade gift! Or heck, just use them yourself. You can never have too many coasters, right?! 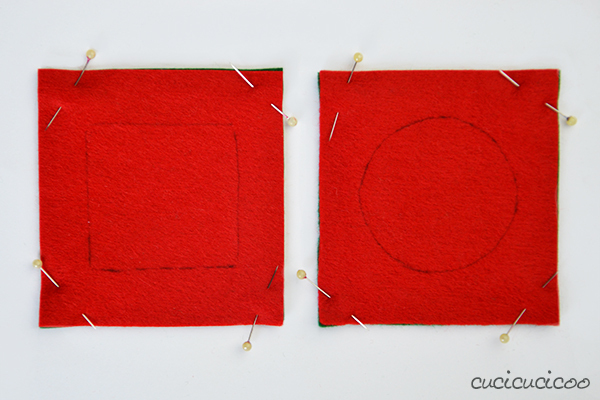 This felt coasters DIY tutorial is part of the syllabus of Cucicucicoo’s beginner’s sewing course! 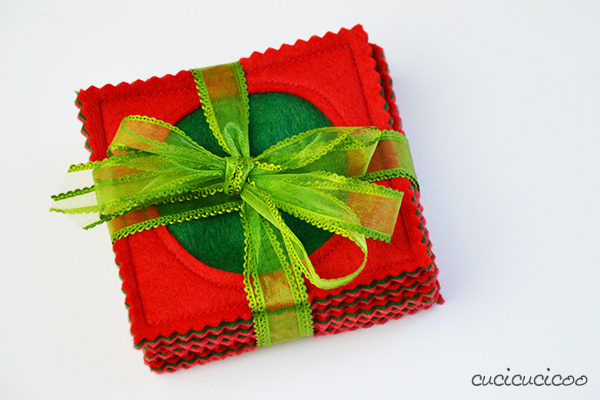 Don’t forget to share pictures of your work on the Cucicucicoo Creations Flickr Group! Next articleBecome a Cucicucicoo Pattern Tester! Great little project. Your lessons are very clear and concise. I have a lot of experience as a beginner’s teacher (of the English language) so I am used to trying to explain things as clearly as possible. I’m glad to hear that it’s coming out that way! complimenti per questo corso!!!! sei bravissima come sempre, e le tue dritte sono utilissime! Ho appena finito il mio splendido sotto bicchiere in feltro ma non so come posso togliere via tutti quei fili senza scucire tutto! !